Pick up at the airport to hotel in Hanoi Central . in the morning we cycle out of Hanoi and head for Hoa Binh town. Along the way we will make several stops, the first of which is the Van Phuc silk village, approximately 12km southwest of the capital. From Van Phuc we continue on to the Ho Chi Minh Trail Museum. Our third and final stop is at the Tram Gian Pagoda, whose origins date back to the 3rd century. From Tram Gian Pagoda we cycle the remaining 50km to Hoa Binh town,Check in hotel and cycle to Muong village ( 10 km ) . Pedal back to Hoa Binh city . where we spend the night. Today we set off for Mai Chau town. As the road becomes very steep in parts we combine cycling with driving in the support vehicle. Upon arrival in Mai Chau, we move to the nearby White Thai village of Lac where we have lunch in a traditional stilt house. After lunch we take to our bikes to discover some of the neighboring villages in the valley. Later we return to the village of Lac where we spend the night. – Home Stay in Thai village. transfer to Man Duc and start to pedal through the rich farming land of the Red River Delta to Cuc Phuong National Park.On our journey there are some opportunities to see ethnic minority people, all friendly and welcoming. Overnight in Cuc Phuong Guest house . – Cuc Phuong guest house . Following breakfast , We start cycle from the gate of Cuc Phuong Park to recharge your energy for 19km cycling to the centre of the park. We will start again around 9am and make a couple of stops along the way to visit the Cave of Ancient Man. We continue another 10km cycle to Nho Quan, we reach Hoa Lu, we are introduced to our bicycles. We then start cycling to visit the two remaining temples of the ancient citadel of Hoa Lu. (12km), just passing scenes of local village life and rice paddies. At midday enjoy a long lunch break near Hoa Luu . We continues with a 1 hour cycle to Tam Coc . O / N in Tam Coc Villiage. Heading out of Ninh Binh Town we embark on a boat trip in Tam Coc passing through the picturesque landscape of rice fields surrounded by limestone formations with magnificent caves. The afternoon we pedal south to visit Phat Diem church complex (40 km).and Cycle to Thai Vi temple and Bich Dong pagoda .Overnight in Ninh Binh. Am : Breafast at hotel . Ha Long Bay is one of Vietnam ‘s most impressive scenic sights. After a short transfer from the town, we embark on a cruise out to explore the world natural heritage dotted with some thousands of rock formations. Along the way we will anchor for a leisurely swim in a secluded cove and a seafood lunch. Transfer to Tuan Chau island before landing to Cat Ba island .we will cycling 15 km more before transfer by van to hotel for check in .Overnight in Cat Ba island . The primeval forest and the tranquil town make Cat Ba Island one of Vietnam ‘s delightful places. 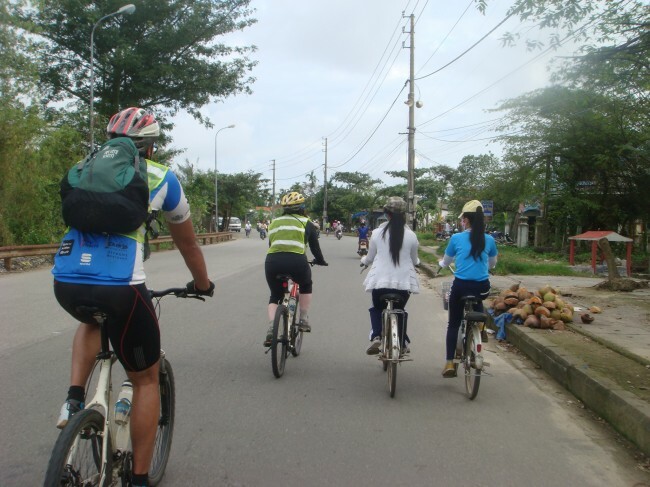 We spend a halfday cycling in Cat Ba, visiting the national park, the central market and the fishing port. The reminder of today is free to relax on a beach.explore local restaurant by yourself . Overnight in Cat Ba. In the early morning we take public ferry back to Hai Phong. You can ride 15km on CatHai island before landing. Then we continue your bike trip more 30km then take a bus back to Ha Noi ), Overnight in Ha Noi. • Cruise from Halong bay – Catba island.